Miss Mani Monster! 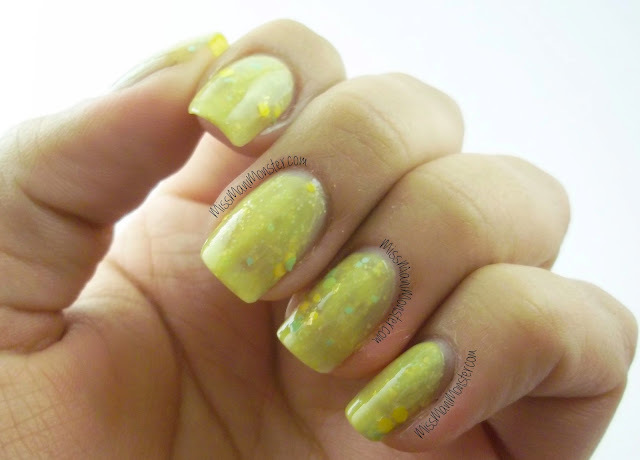 : The Lady Varnishes Swatches! I'm so excited to be swatching a few of The Lady Varnishes for you today! This lovely Indie lacquer can be found right on Etsy, and they are absolutely adorable from the packaging to the polish! First up is The Working Class Hero (Mr. Thornton), a deep grey with blue shimmer and silver and holographic hexes! Perfection in 3 thin coats. Next is What Heroes Are For, a beautiful, shimmery yellow with gold flecks and yellow, aqua, and baby blue hexes. Finally I swatched It's Not Fair, a gray lacquer with pink, blue, copper, white, and iridescent purple hexes. I love this one so much! Please check out all of The Lady Varnishes on Etsy! They're all adorable and they all come with the beautiful charms shown above! Buy four bottles or more in one order and you get silver or copper chain to make a necklace with your charms! I picked up a number of her polishes (in blues and purples) and I'm loving them! Really great formula. I love all three so much!